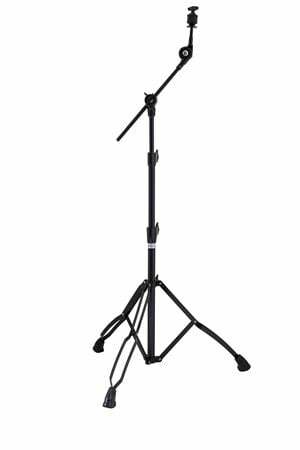 Shop Mapex Mars 600 Series Black Boom Cymbal Stand Double Braced from AMS with 0% Interest Payment Plans and Free Shipping. Mars is a medium-weight line featuring durability and versatility in an affordable selection of double braced hardware. To suit each drummers' unique style, it comes in black plated finish options. Very sturdy, beautiful finish! Perfect for adding extra cymbals. The best hardware on the market! Mapex has stepped up their game with their hardware. It’s road tested and tough! Can’t beat the price! I've been using two of these stands for the past 6 months. They Are holding up so far so good. Have a 18" crash on one and a 16" crash on the other. They don't move around when hit and are very sold. So far no black has started to peel off. Great buy and great price. Great! Just as I expected! It is perfect for what I needed, and of course of high quality as it is made by Mapex! I noticed that all of your products are quality brands and no trash! But, what I truly love is the opportunity to pay things out over a few months! I was forced to quit my job as a mobile DJ because of throat cancer. They removed my vocal cords, so I was forced to retire on disability, which is very hard! I moved to Nashville to live with my sister and decided I wanted to start drumming again. I am 65 and started playin when the Beatles came over! But, since I can't DJ, I figured I could at least jam with others to get back into the music I have loved all my life! I've been trying to build a set a little at a time, but cash flow is a problem! Well, I found AMS and my dreams are gonna be realized, and I can now build a set of high quality products instead of shopping bargain basements and pawn shops! I really appreciate you giving me this opportunity, and will continue building my kit! Heavy duty stands, very sturdy..great buy!! love the black...does what its supposed to do! Don't forget your extra heavy duty stands... always nice to have extra..!! Very nice piece of hardware. Love the black paint job. love the adjustable controls. I trust my cymbals to Mapex. Excellent workmanship, affordable and black finish matches my Pearl Drum hardware. Great item and priced right! Love the black hardware with my new Mapex Mars kit. Very sturdy and priced right!